I am a wife and mother of two boys. I love to scrapbook! Every Monday night I get sucked into the train wreck known as The Bachelor on ABC. Every season I swear not to watch the next. But, I do. Jokingly, I suggested to Kevin that we should do something based on that for his Valentine's Day cards. He loved the idea. So, we had to do it. I made a photo collage with text so we could do 2-up on a 4x6 print. We went with "Valentine - Will you accept this rose?" for the girls in his class. He wore his suit in the photo. I had to make his rose out of tissue paper and a green colored pencil. 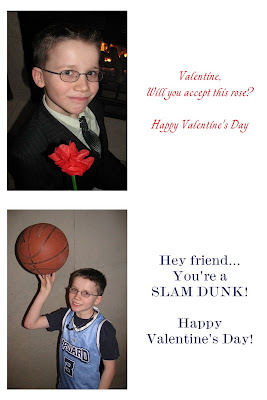 For the boys in his class, he put on his basketball uniform and the cards read: "Hey Friend - You're a SLAM DUNK!" 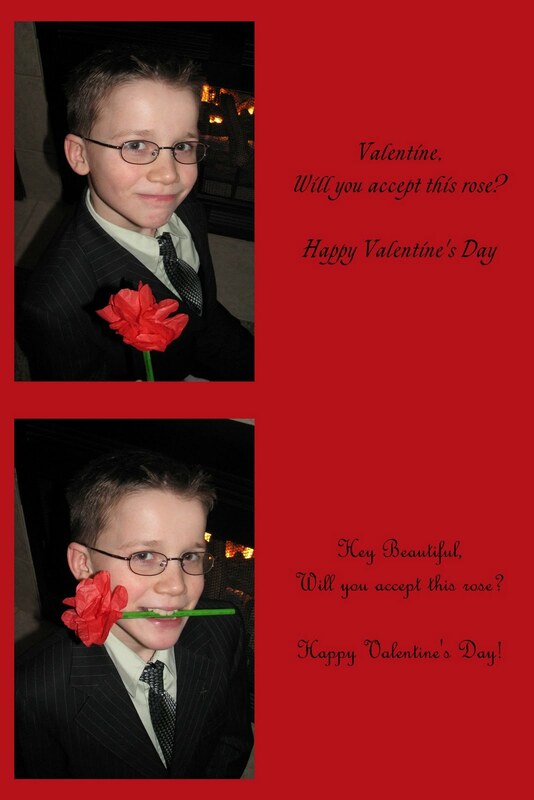 Since there are more girls in his class than boys, we made more for girls and Kevin wanted a red background. We did a second funny pose with the rose in his mouth and the sentiment: "Hey Beautiful - Will you accept this rose?" for me and his aunts. Oh, and we gave that one to his teacher, too! In closing, I'd like to share this layout I scrapped last week about last year's Valentine's Day. I am amazed at how much Blake has changed! I used the February Studio Calico kits Candy Shoppe, Lollipop, Licorice Twist and More Color. I added red floss to the page. I really like hand-stitching even though it slows me down. A lot! 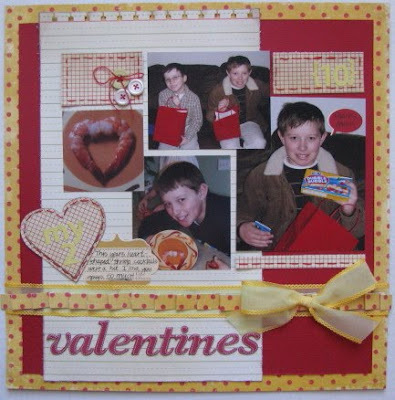 What a cute idea for the Valentine's Day Cards! I love the handstitching on your layout too, adds so much to it! I love this layout. So fun with the reds and yellows. The handstitching adds such a nice dimensional touch--but it does take forever! Such cute Valentine's. I love that he dressed up for you to take the picture. How adorable.